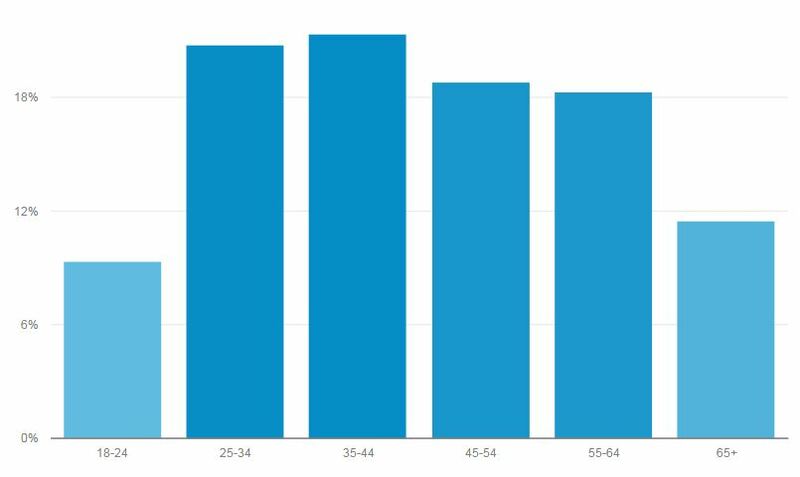 Chart from Google Analytics shows the age distribution of Times of San diego readers in January. Times of San Diego was read by 190,546 people in January — a 50 percent increase from the independent news website’s readership in January a year ago. The site’s readers this January were young, mobile and local, as they have been since the site debuted in March 2014, according to Google Analytics. Millennials and Gen Xers were the primary readers in January, with those 44 and younger accounting for 51 percent of online sessions. That puts the median age at around 44 compared with a median age in the 50s for most television news programs and even older for newspapers. The Times is designed to be mobile friendly, incorporating the latest responsive design, and as a result smartphones and tablets were used for 59 percent of reading sessions in January. The remaining 41 percent of sessions were on laptop and desktop computers. Readers in San Diego County accounted for 40 percent of online sessions in January followed by readers elsewhere in Southern California at 15 percent. The balance of traffic was national and even international, because San Diego news is widely followed. Time of San Diego publishes 20 to 25 articles daily about all aspects of life in San Diego County — from news to sports to business to the arts — produced by a staff of seven contributing editors and photographers. An email newsletter with top stories is published daily at 8 a.m. The free site is supported by advertising and reader donations. News releases and story tips are accepted at news@timesofsandiego.com and advertising information is available from advertising@timesofsandiego.com.